Situated in a picturesque beachfront setting, we offer gracious lodging for your perfect getaway in Newport, Oregon. 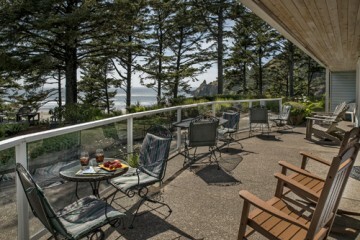 Spectacular views of the Pacific Ocean and incomparable Oregon coastline can be seen from every window. The inn has wonderful common areas to read, socialize or enjoy a glass of wine at the end of the day. Outdoor garden paths lead to comfortable decks overlooking the beach with breathtaking views. Nothing says relax like an open wood fire and a beautiful sunset at the coast. Each guest room offers a king or queen bed, private en-suites, some with jetted tubs, and many amenities to make your stay memorable. Minutes away from downtown Newport Oregon and the Nye Beach area, but tucked away from the hustle and bustle making Ocean House convenient for all your entertainment and dining desires. Wherever your journey takes you, come stay awhile. Shed the cares of the world, disconnect, and rejuvenate here at Ocean House. Complimentary wine, soft drinks, and fresh baked cookies. TV/DVD on request (for movies). A private pathway to miles of beach, waves, and tidepools. Close to first-rate restaurants featuring local seafood and produce. Central Oregon coast attractions just minutes away.